I love playing with data. My data makes it even more fun. Wordle has been around for a long time, and so has Twitter (in Internet years anyways). I have always been fascinated by word clouds and visualizing text patterns, etc. I figured that hey, there has got to be some analyzer for your twitter stream, and I am sure there are a ton, but I didn’t stumble upon any with some easy Googling, so I did it the hard way. First goal? Get your Twitter feed and/or data somehow. Multiple ways to do this, but I stumbled upon a pretty cool site. http://tweetbook.in that let’s you create an eBook from your Twitter feed and favorites. It let’s you publish out as a PDF or XML file, so I figured that would work. It is a busy site and you may have to wait to get in but once you do you just oAuth it up to Twitter and grab your data. A "Manager" class is like my grandmother's junk drawer. As you can see, I am just loading up the xml file and doing some text cleanup (removing the xml text blocks and removing RT’s, the old syntax which muddies up the results). Note in LINQPad you need to change the query type to C# Statements instead of the default C# Expression. 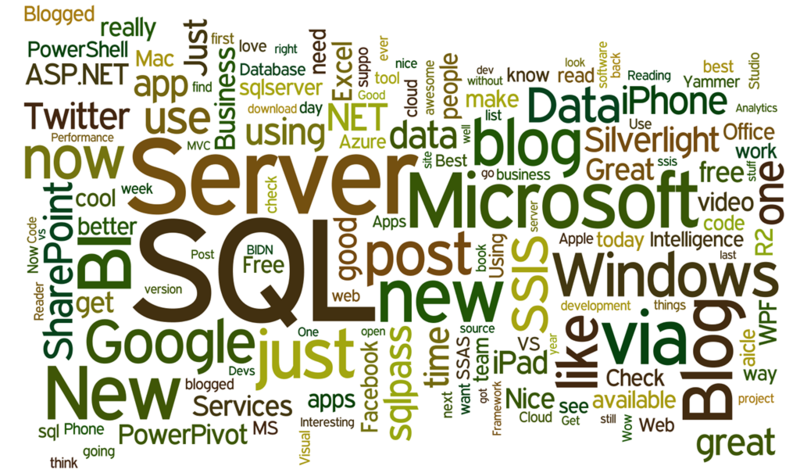 You can see I really like to favor SQL Server, Microsoft, iPhone, Blogs, sqlpass, Google, SharePoint, Twitter, and pretty much everything geeky. Pretty dang cool. Why doesn’t Twitter offer something like this? I think it would be cool. What other cool things have you done with your “data” – what cool things would you like to see?